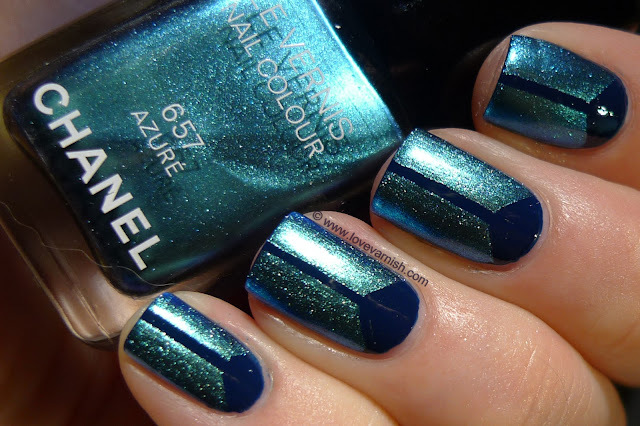 Love Varnish: Chanel Azuré and my first v-gap manicure! Chanel Azuré and my first v-gap manicure! Hi loves! I a so excited to show you this look today! I've never done a v-gap before, and after seeing this beautiful manicure by Emma I knew that's how I wanted to use Chanel Azuré. I know I said I didn't need it, but I couldn't resist when it was 21% discounted. And I must say, I am very happy I got it! The beautiful color, the lovely application.. all perfect. So to create this look you'll need a few things: a basecolor, a secondary color (contrasting, different finish, ton-sur-ton, creme on creme, it could be anything you like! ), and (striping) tape. 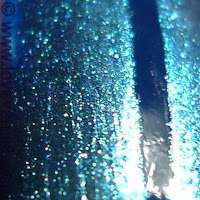 Paint your basecolor (I used OPI I Saw.. U Saw.. We Saw.. Warsaw in 2 coats) and let it dry for a while. 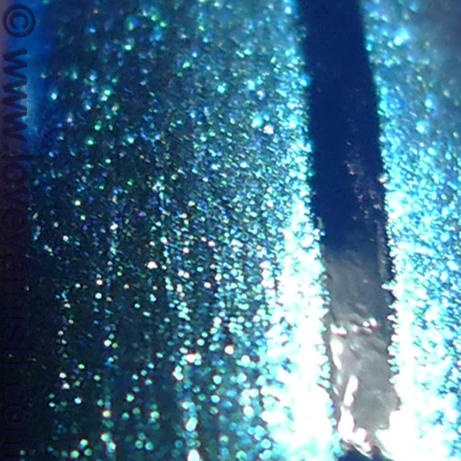 You could also use a quick dry topcoat but I prefer to let it dry on it's own, to prevent thick nails. After it's dry, you need 3 strips of thin cut or striping tape (I prefer striping tape), and place one strip in the center of your nail. Then, creating a V shape at the bottom, place the 2 other strips starting from the center, pointing downwards. Paint your secondary color over the 2 top parts and remove the tape immediately to get crisp lines. Let it dry for a while and topcoat the thing! Have you caved and bought this beauty? And did you ever try a v-gap manicure? 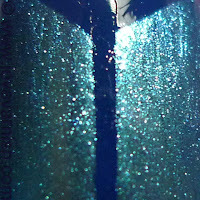 holy moly this is one super gorgeous mani! I love your v gap! I would try if I thought I could do it neatly. I did cave to Azure. And Bel-argus. just too pretty to pass up. But amazingly I did resist the spellbinding beauty of Taboo. Thanks Lorraine, you are so sweet! If you take your time it really isn't that hard to do - it does take some patience though. But it is so preeeetty :D!